On one of the hottest days so far this summer, I set out to prepare a dish more suitable for below-freezing winters in Siberia. As part of an effort to prepare baked goods from all corners of the globe, I’ve begun randomly selecting coordinates on Google Maps and preparing a bread or dessert recipe from that region. The first location that happened to come up was Siberia, where the average July temperature is only 63 degrees F. I know little about Russian breads and desserts, beyond well-known staples like black bread, so I was excited to learn more. What I’ve created here is an extremely loose interpretation of shangi. I really should have followed the recipe exactly the first time around. But as often happens when I cook, a strange combination of laziness and inventiveness prevailed. The recipe I used calls for topping the shangi with a mixture of potatoes, vegetable oil, and sour cream. After deciding to substitute Greek yog urt (which I already had in my fridge) for the sour cream (which I didn’t), I felt the urge to take additional creative liberties, and all efforts to prepare authentic shangi went out the window. 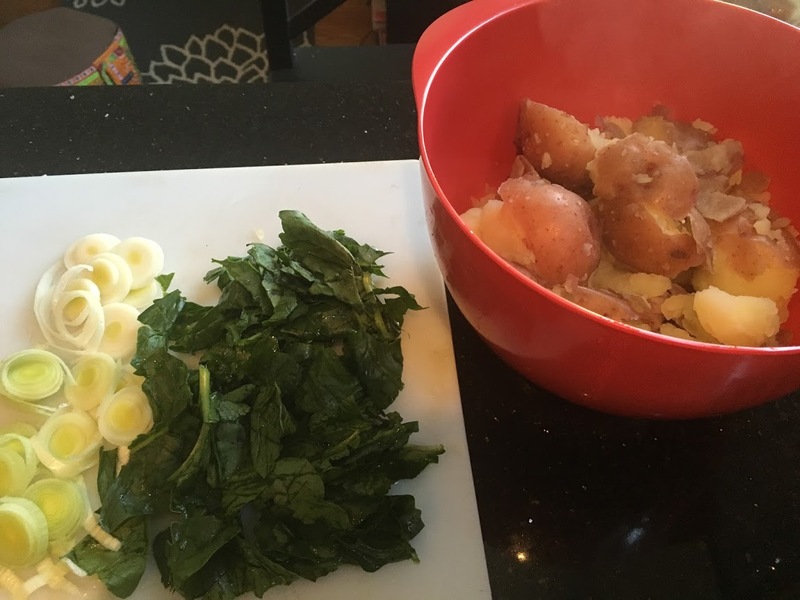 I figured leeks and spinach would go well with the potatoes, and add a green, summery touch to an otherwise wintry dish, so I sliced and chopped some up and sprinkled them on top. 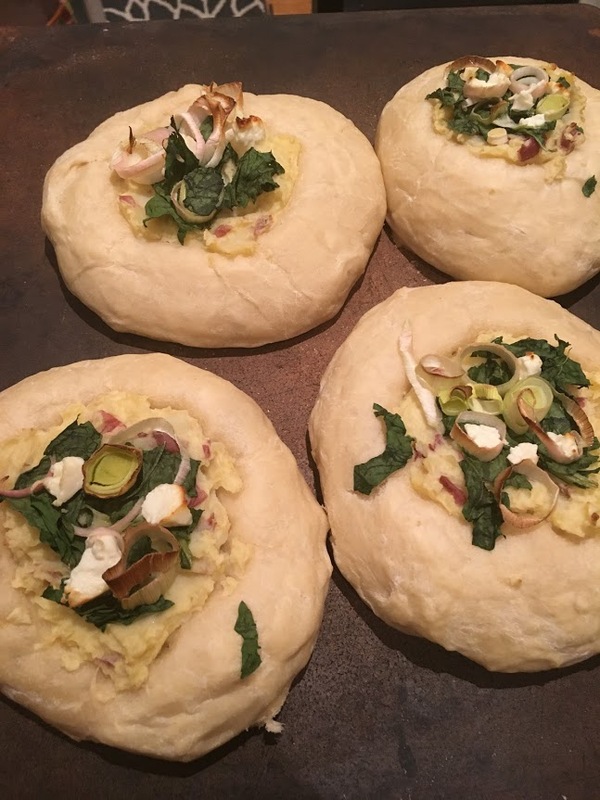 The recipe was vague when it came to the pie crust, calling only for the use of “yeast dough” – it was only later that I found the Russian food blog, with its recipe for traditional rich, buttery shangi dough – so I prepared my favorite pizza dough recipe. After shaping the dough into several small disks, I brushed each round with olive oil to ensure a crisp crust, as I always do when preparing pizza. Per the recipe’s instructions, I created a well in the center of each disk and spooned on generous heaps of potato filling, followed by my entirely unauthentic toppings. So here you have it, for better or worse, my summery spin on a dish that has sustained generations of northern Russians through harsh winters (the average January temperature is -25 degrees!) and summers not nearly as warm as those in New York. Fill a medium-sized pot with water and sprinkle in salt. Boil potatoes until soft, and then drain water. Mix in oil, salt, Greek yogurt, and egg. Set mixture aside. Slice leeks, chop spinach, and cut feta into small cubes; set aside. Divide pizza dough into even-sized portions (I divided mine into 5 portions) and roll each portion into a ball. Flatten slightly into a disk shape. Place disks on a baking stone or parchment-lined baking sheet. Cover and let rise again for 20 minutes. Using your hands, form a shallow well in the center of each disk. Spoon a handful of potato mixture into each well. Sprinkle with spinach leaves, leeks, and feta. Bake for around 20 minutes, until leeks and feta begin to brown slightly and the potato mixture is cooked thoroughly.